Space Cadets and Lunarphiles in Doncaster were delighted this week to learn that an online petition to get Doncaster Borough Council to put a man on the moon is nearing its target. Local man Christian Pyle launched his petition three months ago and thanks to astronomical interest on social media he now has five and a half thousand signatures and is rocketing towards the six thousand mark. Asked why he wants the council to take this giant step for Doncaster, Christian said: "It would be great to do something positive for the town for a change. This area is becoming really depressed: businesses are closing, local amenities are falling into disrepair and people generally seem to think that the future for Doncaster is pretty bleak. A properly funded space programme will provide a much needed boost for the local economy and be a source of civic pride." Inevitably Christian has been inundated with potential volunteers for the moon-shot, all eager to leave the dismal environs of Doncaster behind them and experience somewhere with even less atmosphere. But Christian already knows the man with the right stuff. "My mate Tony reckons he's up for it," he told us. "He's really bored at the pickle factory at the moment and says that he wants to strike out in a new direction. Also, when we were at school he was always doodling spaceships during the maths lesson, so actually he's halfway to being qualified." 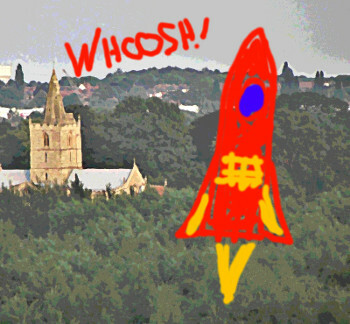 Surprisingly, Doncaster Borough Council seems to be taking the proposal seriously, even though no one seems confident that the idea will get off the launch pad. "We don't really have the facilities for this at the moment," said Councillor Ronnie Backhander. "Budget restrictions have meant that we've had to make some severe cuts. Last month we had to let half the street cleaning staff go, which hit us pretty hard, so managing a successful blast off is a big ask. Still, we've got Mary in the Planning Department looking into it and we're expecting to hear from her by Tuesday." In the meantime, Doncaster Borough Council remains fully committed to its ongoing project to tunnel to the Earth's core. So far they have a hole nearly three and a half feet deep. Following an injection of cash from a corporate sponsor they now intend to invest in another shovel and hope to reach the upper mantle by next June.